Known as Britain’s first ever independent industrial designer, Christopher Dresser was a major contributor to the British Anglo Japanese and Arts & Crafts movement. A talented botanist, writer and designer his distinctive style in textiles, ceramics, metalware, glass, carpets and wallpaper has achieved worldwide acclaim and today his work can sell for hundreds and thousands of pounds at auction. 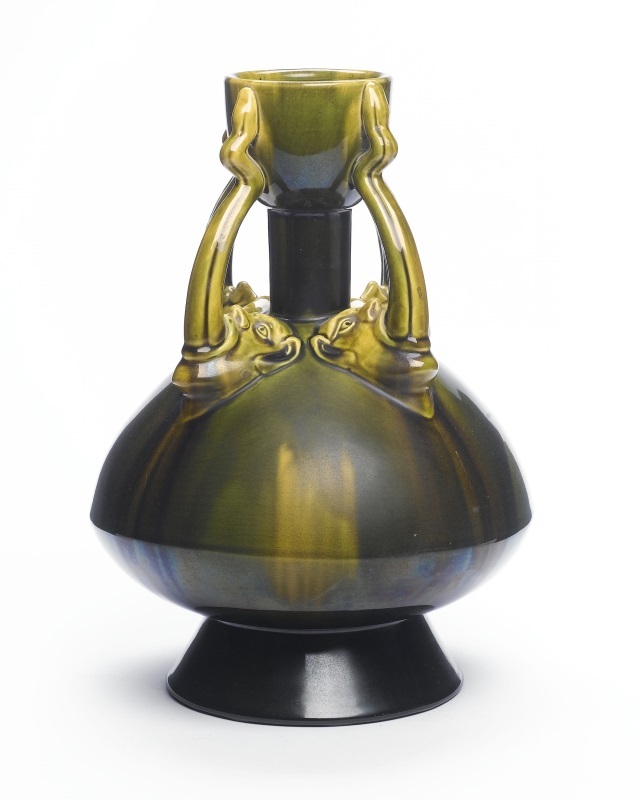 Born in Glasgow on 4th July 1834, Christopher Dresser was an extremely talented child. By the early age of 13 he had won a place at the Government School of Design where he specialised in both design and botanical studies. This system of education had been set up to encourage young talents to train as designers for industry and it was whilst attending the college that Dresser met some of the most influential design reformers of the time, including decorator and architect Owen Jones who was to become Dresser’s mentor. In 1849, after two years of study, Dresser left college and began to earn his living by conducting lectures on botany. Being a skilled writer he also wrote many text books on this subject but was disappointed when he failed to win the Chair of Botany at the University of London, so made a decision to turn his hands to design. Setting up a studio from his house in Hammersmith, Dresser gained inspiration from his passion of plant life. He believed that nature had not only a clear functional purpose but also a simplicity which he transformed into his design ethics. By 1868, Dresser was involved with many projects, not only in his role as a designer but also as a manufacturing advisor, teacher and author. He soon became extremely successful and was designing for as many as 50 manufacturers who all wanted to capitalise on his unique style. At the time he was a household name, famous for his revolutionary yet radical industrial designs which could be appreciated, efficient and practical for ordinary people. Working with many different materials from silver to carpets and glassware to wallpaper, his huge commercial success was celebrated by all. One of the most impressive areas of design for Dresser was that of ceramics. He was the first European designer to visit Japan in order to exchange European design ideas with the Japanese and was privileged to observe the manufacturing process and craft before returning to the UK with a new born passion for Japanese culture. Combining this with his botany inspired designs many manufacturers such as the Staffordshire based potteries Minton and Wedgwood commissioned works from Dresser as they realised his unique style of design was revolutionary. Although over the years Dresser had undertaken many projects from leading manufacturers he had little control over the usage of his own designs. Desperate to establish his own identity he exhibited at the 1871 London International Exhibition with everything from ceramics to metalwork and carpets to textiles under his own name. This worked, and it was then that he started to place his signature on his works and Dresser became a brand and not just an anonymous designer. In 1879 Dresser’s career took on another dimension when he was appointed Art Director at the newly established Linthorpe Pottery near Middlesbrough. Heavily influenced with Japanese motifs and inspired designs, his work for Linthorpe was extremely archetypical of the Anglo-Japanese style and the vessel forms were also highly inventive and innovative. He then went on to work for the Ault Pottery in Derbyshire where he produced all kinds of wares in ceramics. It was whilst working as a designer at this pottery that Dresser started to experiment with decoration and used a shimmering aventurine glaze on much of his work. 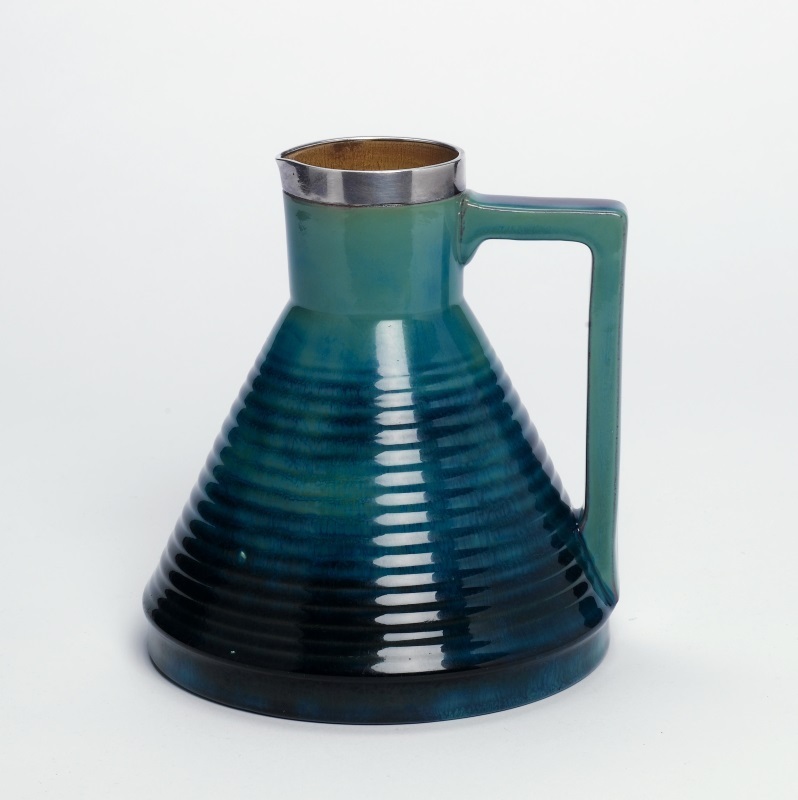 When looking at the designs for the Ault Pottery you can instantly see his distinctive style as not only are the vessels unusual in form and decorated with the shining glaze but also the colours are generally streaked or mottled down the vessel. Ceramics was only one particular area which Dresser excelled in, as he had also created hundreds of wallpaper designs, worked in silver plate for Elkington and James Dixon, designed with cast iron for Coalbrookdale and in 1858 alone had supplied Ward of Halifax with over 150 designs in textiles. 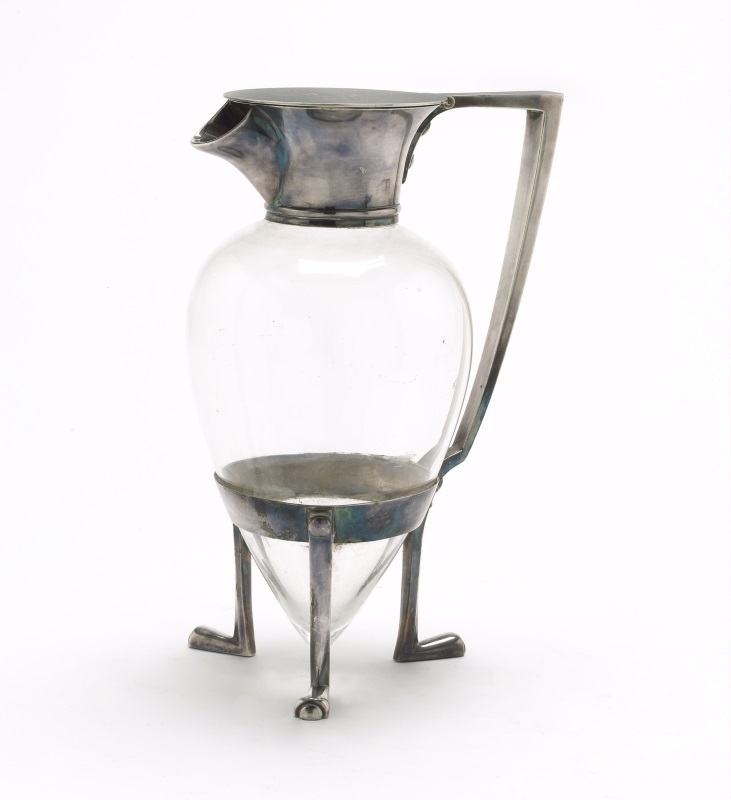 In fact Dresser started to design everything that the Victorian home might need from tea services to claret jugs – with one of his most iconic designs being the silver and electroplated toastrack for Hukin & Heath. Although Dresser was foremost a designer, he was also a talented and skilled writer. He had many of his articles on botany published, had written three botanical books and received a doctorate from JenaUniversity. By 1862 he had written and published The Art of Decorative Design which set out his own ideas on how design should be approached and also wrote a series of articles on the Principles on Decorative Design. However his most prestigious piece of writing was a book entitled Japan, Its Architecture, Art and Art Manufacturers which was published in 1882 and outlined his passion and enthusiasm for Japanese design which in turn also advanced other designers outlook on the Japanese styles. The Art Furnishers Alliance Company was set up by Dresser in 1881 in New Bond Street. This retail outlet sold many of his designs which ranged from metalware to fabrics and ceramics to glass. The majority of the items sold were designed by Dresser although he did employ studio assistants whom also helped execute his designs. Sadly this business failed and was forced to go into liquidation just two years later in 1883. Much of the stock was ceased and sold at auction to pay the creditors. Although sadly the Art Furnishers Alliance ceased, this did not stop Dresser for continuing with his design and writing careers. He still worked from his studio and in 1886 published ‘Modern Ornamentation’ which featured works that his students and assistants had created. Dresser continued to design from his studio for a further 18 years although he never again became as renowned for his designs as in previous years. Dresser married Thirza Perry in 1854, together they had 13 children. 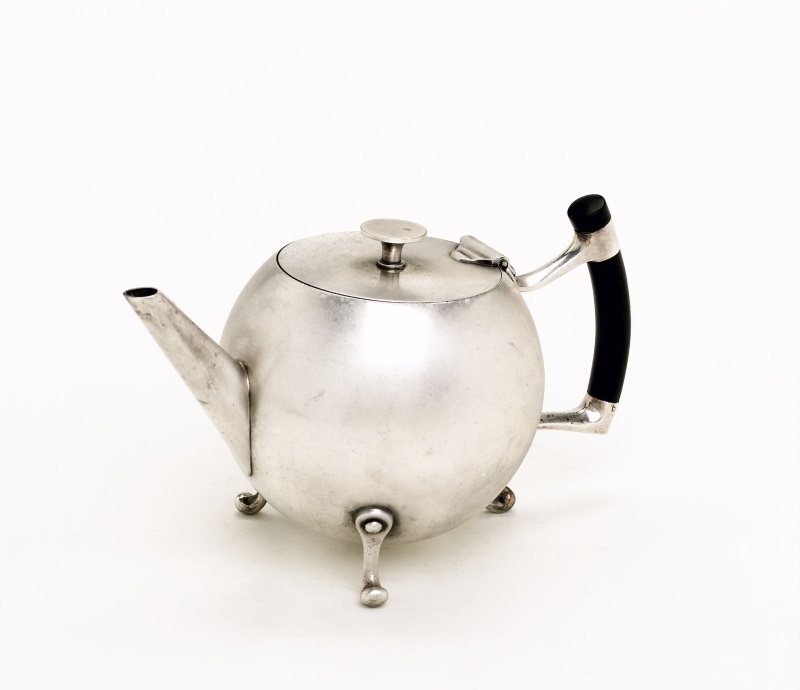 In 2004 a Dresser electroplated teapot c.1879 sold for £94,850. There are only six known to be in existence. Dresser parted company with Linthorpe Pottery in 1882 although his designs continued to be placed into production until 1889 when the pottery closed. Dresser designed a collection of fantasy vases, each had goats head handles and long necks. These are extremely rare to today. The V&AMuseum held a retrospective of Dresser’s works in 2004.